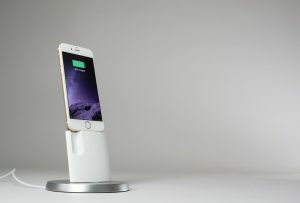 Finally, to wrap up our Landing Zone review series, we will conclude with the IONA dock for the iPhone and iPad. The IONA is a great dock for those who are looking for something to hold an iPad or iPhone in order to FaceTime, watch movies, listen to music, read recipes, or do a variety of activities without having to hold your device. The aluminum base is 4.5 inches in diameter. The dock stands at 6.5 inches tall and is a white, plastic material. It weighs in at 1 lb. Most of the weight is in the sturdy base which has a rubberized bottom to accommodate a solid hold. The base also rotates 120 degrees, so you can easily adjust to your viewing preference. The backing that your device rests on is an aluminum material like the round base. Included in the box are different bumpers to make many different iPhones and iPads compatible. You can use it with iPhones 5 and 5s, and all the way up to 6s and 6s Plus. Do you have an iPad mini? The iPad minis 2 through 4 will work as well. The iPad Air and the Air 2 can also fit. The IONA is relatively easy to use. Here’s a great video that can show you how easy it is to set up. 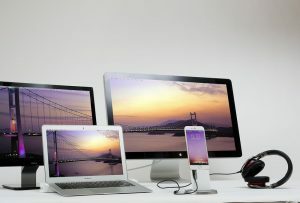 As you may have seen in the video, you can charge your device while it is docked. It didn’t use to come with a Lightning Cable, but the company decided to start including one that is 4.5 feet long, and it is an official Apple cord. You can also use the one that came with your phone. 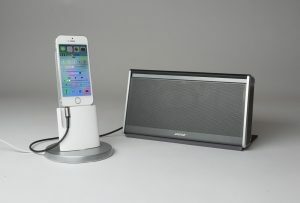 All in all, a great little docking station that sells for a very reasonable price of $19 on the Landing Zone website. This concludes the series of Landing Zone products we were sent to review, and I’ll throw in the disclaimer that we have not received any compensation from this company, and this is my fair and unbiased analysis of the product. I’ll also include the photo credit to Landing Zone for all pictures used in these reviews.